Five-star running back Zachary Evans prides himself on research. He knows he is the most coveted running back in the 2020 class and holds a list of items important to the Galena Park North Shore star when it comes to recruiting. One is a strong offensive line. One is a great strength and conditioning coach. The most important is his teammate, Damieon George. Evans wants his left tackle to block for him in college. The two are close and take college trips together. Both iterated that going to the same college was at the top of their wants in a program. Evans holds more offers, so he’s prepared to follow George to the school that prioritizes both of them, instead of just Evans. 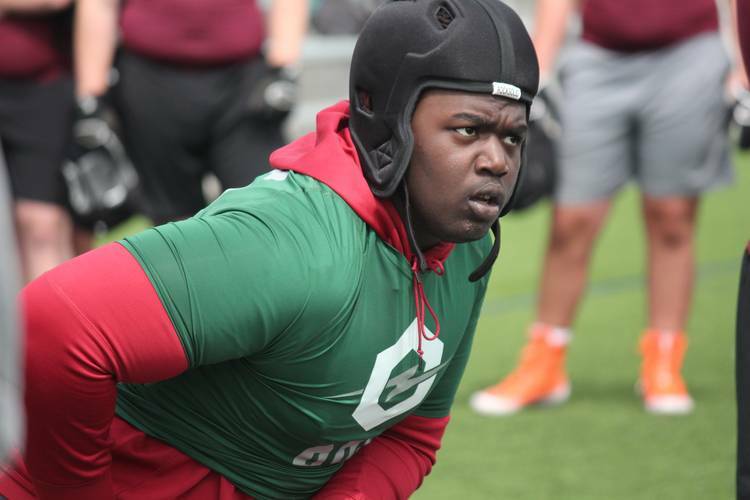 George is among the five priority targets for the Longhorns along the offensive line. Jake Majors, Jaylen Garth and Logan Parr are already committed. Texas feels good about its chances with four-star Chad Lindberg, who is also close with Evans. That leaves George. That means a similar top five is expected from Evans, though he doesn’t plan on picking a school until national signing day. Evans is the No. 1-ranked player on the 2020 Fabulous 55 and a generational type talent. He led North Shore to a Class 6A Division I state title and put up video game-like numbers at The Opening, recording a 4.4 laser-timed 40-yard dash and a 3.84 time in the shuttle. He also posted a vertical of 40 inches. It’s a testament to Evans’ drive as a football player. He stands with little to gain by competing in these elite camps, but he goes to prove his ranking and improve his game. That’s why a quality relationship with the strength and conditioning coach is so important to Evans. His goal is to clearly reach the NFL and he knows that requires even more work at the next level. That’s good news for the Longhorns.